One of the great channels of promoting ways to reduce waste is through schools and teaching children how to reduce, reuse and recycle. And with this in mind, I would like to introduce the Packasaurus Ex, which has been created by Caroline Fish, the Waste Awareness Campaign Officer of Suffolk County Council. The lovely monster was on loan to St Edmundsbury's Kate McFarland yesterday for a visit to a local school, to promote Zero Waste Week at a press launch. I was in the unusual position of having an hour to spare, so popped over to take some photos. 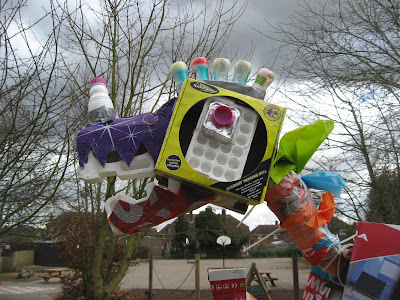 Packasauras Ex, the Excessive Packaging Monster drew the attention of many of the children, who were asking how it was made and they had great fun trying to spot familiar packaging that they have at home. 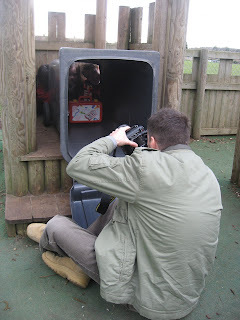 It was easy to see how keen and interested the children were, firing off questions left right and centre. They showed great interest in the excessive beastie, about which you can find more information at the Suffolk Recycling website. Radio Suffolk were present for an interview with Councillor Stevens, the local portfolio holder for Environment and Street Scene, as were photographers from the local press including The BFP and the East Anglian Daily Times. 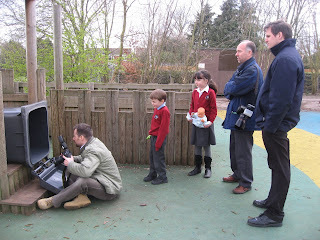 Here you can see a photograph of the photographers, who were taking images to promote the school's toy swap scheme that they are organising for Zero Waste Week. There are lots of resources and ideas to support waste awareness for schools. St Edmundsbury are working closely with local schools to organise Zero Waste lunches and toy swaps. Suffolk Recycling are also running their very own Design a Bag Competition for its 2008 Waste Challenge. Further afield WRAP are promoting a rapping robot, which can be loaned out to schools around the country. Our local school is also getting involved next week, which should be a fantastic learning experience for the children. More on that next week. In the meantime, if you live in Bury St Edmunds, be sure to get your March issue of About Bury which has got a fab feature about Zero Waste Week and The Rubbish Diet, written by "Yours Truly". You can find it in our lovely independent shops, plus some other major locations in and around Bury St Edmunds. By the way, I am sorely tempted to have a big clear out next week and book our local radio station's Black Thunder to come and collect the stuff that can be re-used. They are promoting Green Month throughout March. If you're wondering what I am on about, take a look at the SGR FM site to find out more about the Black Thunder pick-ups. There are also competitions for schools as well as a great online game called Beat The Binman, which is not just entertaining for children, it's great for adults too. I just wanted to say a public thank you for the help you gave me yesterday! A.M.A. was left holding the monster in the freezing cold while I ran around supervising photos and interviews! Sounds glamourous, it REALLY wasn't! So a very big thank you!! !